The days of taking care of business exclusively in an office are over. You've got a powerful productivity gadget in your pocket practically 24/7, after all — and with the right set of apps, you can stay synced with the same spreadsheets, documents and presentations that are on your desktop and work with them seamlessly from anywhere. Best of all? Achieving that level of connectivity on Android no longer requires a compromise. It's been a long time coming, but the bar has really been raised when it comes to office app quality in the Google Play Store over the past few years. The question now isn't if you can find a worthwhile set of office apps for your phone but rather which set of commendable offerings makes the most sense for you. I've spent time testing all the relevant contenders, ranging from the small-name efforts that used to dominate my recommendations to the big-name products from the more well-known productivity players. Focusing on factors such as feature availability, ease of use, ecosystem integration and overall user experience, these are the best office apps on Android today. Note: Looking for messaging apps? I'll be covering those in a future roundup. Keep an eye on this page or follow me on Twitter to find out when it's available. Microsoft was embarrassingly late to the Android app party, but since the company started taking the world's most popular operating system seriously, its Android productivity services have been among the best around. That remains true today with its core Office offerings: Word, for word processing; Excel, for spreadsheet editing; and PowerPoint, for presentation work. 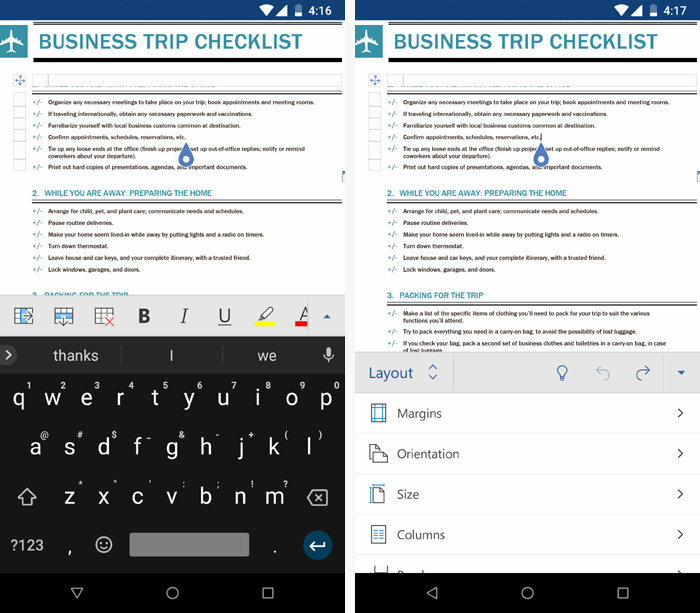 If you're used to using the equivalent Office 365 products on the desktop — or if you just need fully featured mobile office apps with all the bells and whistles — Microsoft's trio of Android apps is going to be your best all-around option for on-the-go productivity. Perhaps the greatest strength of Microsoft's Android apps is their effortless cross-platform compatibility and consistency: First, as you'd expect, all three apps handle standard Office file formats flawlessly and with pristine formatting fidelity. 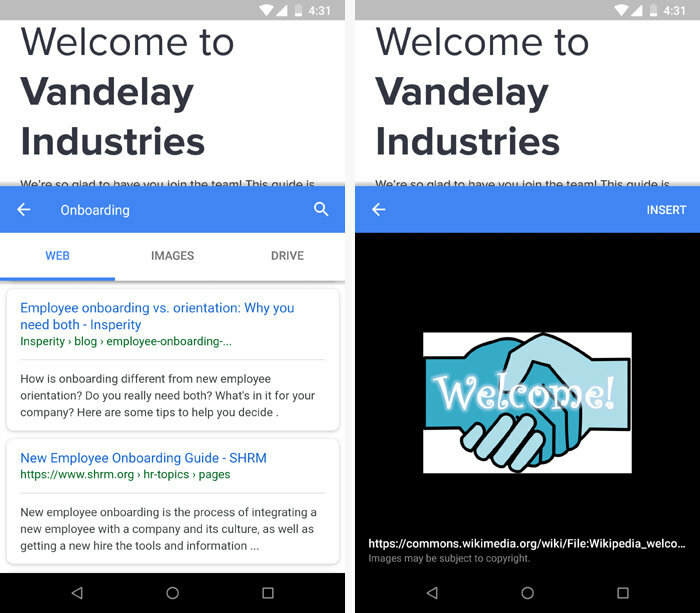 And beyond that, if you're already using Word, Excel or PowerPoint in any other setting, you'll have essentially no learning curve with the matching Android versions; the apps' interfaces and interaction styles will be immediately familiar and easy to master. Word, for instance, starts off with a small, scrollable toolbar — a sized-down version of the Office Ribbon. It's a smart way to conserve space and allow you to have a large working area (especially when a virtual keyboard is present and taking up a significant portion of your screen). Tapping an arrow at the toolbar's right side, meanwhile, expands the toolbar into a larger form with menu sections corresponding to most of the Ribbon tabs you see in Word's desktop or web app: Home, with common commands for basic text formatting; Insert, with the standard full range of options; Layout, with commands for adjusting your document's margins, orientation, column configuration and so on; Review, for checking spelling or word count, managing comments and activating Track Changes mode; and View, for moving between different layouts and zoom settings. Microsoft Word's toolbar in its sized-down, scrollable form (at left) and when fully expanded (at right). The Word app's toolbar also has a Draw section, which is present in the desktop version only if your device has a touchscreen. It allows you to select from a variety of tools for drawing or highlighting directly on your document with your finger or a stylus. Missing from the app's toolbar are Design, References and Mailings sections; most of those options are just scattered across other appropriate-seeming areas. The same approach and expansive feature set applies to Excel and PowerPoint as well. 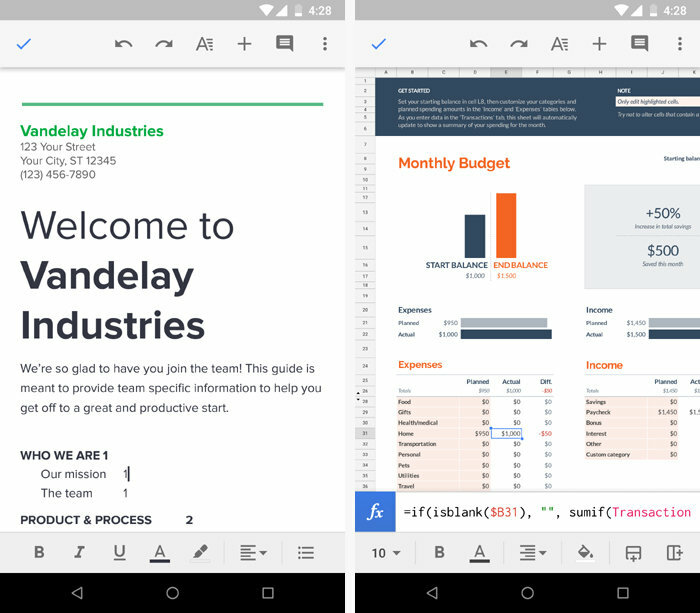 There's really not much of anything you can't do with Microsoft's Office apps on Android — including collaboration (so long as your co-workers are also in the Microsoft ecosystem) and cloud synchronization: Out of the box, the apps support both local device storage and cloud-based storage with Microsoft OneDrive, and they provide simple options for connecting cloud-based accounts from Box, Dropbox, Google Drive, and other providers for seamless in-app access. 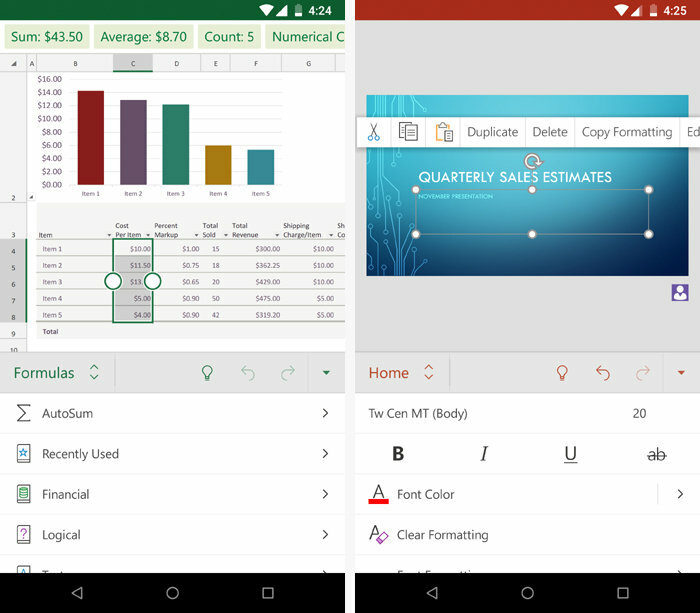 Microsoft Excel and PowerPoint provide familiar and feature-packed interfaces on Android. The one asterisk to all of this: In order to get the apps' complete set of features — or to use the apps at all on devices with screens that are 10.1 in. or larger — you'll have to pay for an Office 365 subscription, which runs $70 per year for individuals, $100 per year for families (with up to five users), or $99 per user per year for businesses. That subscription unlocks a laundry list of advanced options, including the abilities to track and review changes, change page orientation, insert page breaks, and apply custom colors to text, shapes, and cells. Assuming you already have such a subscription for desktop access, going with Word, Excel and PowerPoint on Android is pretty much a no-brainer. If you aren't already subscribed and don't necessarily need office apps with oodles of advanced features, though, the next option might be the better fit for you. 'Twas a time when Google's mobile office apps were barely usable, bare-bones affairs. Make no mistake about it: Those days are no more. Nowadays, Google Docs, Sheets, and Slides are thoroughly polished and impressively capable on-the-go productivity tools. They boast tight integration with the broader Google ecosystem, along with a first-class system for syncing, collaboration and effortless cross-device access. That last item is a critical part of the apps' appeal. If you're already invested in the Google ecosystem, personally or professionally — using Google Drive for storage, Gmail for email and so on — Docs, Sheets and Slides will fit naturally into your existing setup. You'll use your same Google account to access them (and you won't even have to sign in at all from your phone, since your account is already connected at the operating system level). You'll be able to work on colleagues' shared files right from your regular interface. And everything you do will be connected to your Drive storage and easily accessible from most any Google app on any device or platform. The Docs, Sheets and Slides Android apps are easy to navigate and have all the basic features you'd expect for their respective categories. In Docs, for instance, you can style text, insert tables, adjust alignment and insert a variety of different types of bulleted lists. In Sheets, you can style and merge cells, create charts and find and use all sorts of common spreadsheet functions. And in Slides, you can use rich formatting tools, add speaker notes and insert your own custom backgrounds. Google Docs and Sheets have easy-to-use interfaces with all the basic features you'd expect. Google also adds in some distinctive touches, such as Docs' Explore function, which allows you to search both your past work and the full web right within the word processor and then view results alongside your document — even inserting text or images from other sources directly into your current work, if the need arises. In Sheets, meanwhile, you can use Google's Cast function to wirelessly show a presentation on any Cast-compatible TV or display without any special configuration. Google Docs' Explore function allows you to perform advanced searches in a split-screen view and then insert images or text directly into your document. It's in the more traditional advanced word processing, spreadsheet and presentation commands that Google's apps lag a bit behind Microsoft's — not being able to style tables within documents from the Docs app, for example, or not being able to sort rows within a spreadsheet in Sheets. If you need those sorts of beyond-the-basics capabilities, Google's apps won't be right for you. Docs, Sheets and Slides also use proprietary Google file formats instead of the typical Microsoft formats — but practically speaking, that really isn't a big deal anymore. Google makes it incredibly easy to import and open any common file format, and it makes it equally painless to export and share your files in any format you need. Google's apps are completely free for individual use, without any restrictions. For enterprises that require a fully managed setup, the company's G Suite program starts at $5 per user per month. 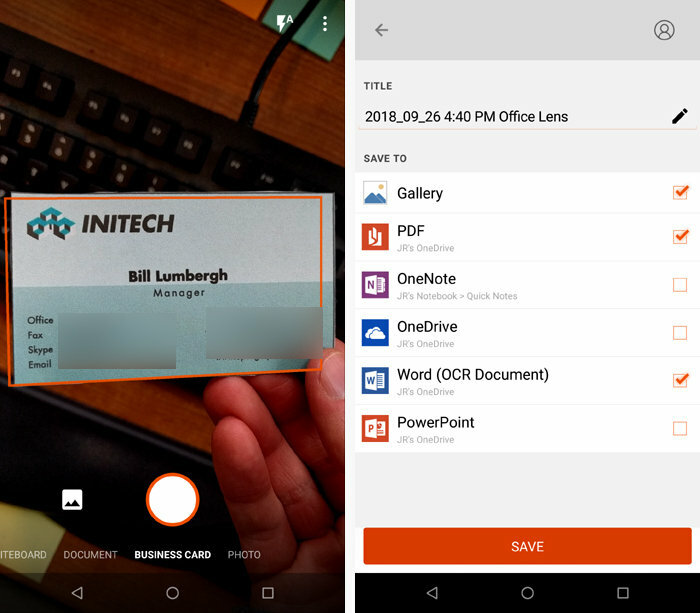 The simplest, most effective and most versatile tool for scanning and processing physical documents from your Android phone is Microsoft's free Office Lens app. Office Lens fires up your phone's camera and starts looking for scan-ready objects as soon as you open it, and it quickly and consistently identifies relevant areas of content to capture — whether they're part of a business card, a paper document, a photo, a whiteboard, or even a computer screen. Whatever the case may be, Office Lens does all the heavy lifting for you: All you have to do is confirm what type of content you're collecting and then tap a shutter button to make the capture occur. Office Lens will then show you the final result and allow you to edit or recrop if needed — but in my experience, the app is spot on more often than not, and adjustments are rarely required. From there, it's up to you what happens next: Office Lens can simply save the image as a JPG to your phone's local gallery, or you can instruct the app to upload the captured content to OneDrive for further processing — most notably as a share-ready PDF or as a plain-text Word document, in which all visible text from your capture is extracted and ready to be copied and pasted wherever you need. Office Lens can also save the resulting file into your Microsoft OneNote account or place it directly into a PowerPoint presentation. Annoyingly, the app offers no options for connecting directly with non-Microsoft services, but all it takes is a couple of extra taps to share anything you've scanned — as a regular image, a text-oriented document or a PDF file — to any other service present on your phone. Office Lens brings a potent combination of power and simplicity to smartphone-based document scanning. If you do use Microsoft's services, Office Lens will allow you to search the text of all your saved scans within OneDrive. It can also extract contact details from scanned business cards and then save that info directly into your OneNote storage. And if you prefer Google services, by the way, Google Drive has its own Android widget for scanning. It'll save your image as a PDF in your Drive storage and make its text searchable to you there — but that's about it; all in all, Drive's scanning feature is significantly less versatile and powerful than Microsoft's standalone equivalent. If you ever need to create, edit or mark up PDFs from your phone, Xodo PDF Reader & Editor is the app you want. The free utility has everything you could possibly need for mobile PDF management — and it's incredibly easy to use. Xodo allows you to create new PDFs from images, documents and web pages. It'll even let you create a blank PDF, which you can then fill with your own text or handwritten elements. The app has a simple feature for merging multiple PDFs together into a single file and even modifying existing PDFs to add, remove or change the order of their pages. On the annotation front, Xodo provides a robust set of tools for highlighting text, underlining text, adding new text or handwritten elements, and adding Post-It-like comments onto a PDF. 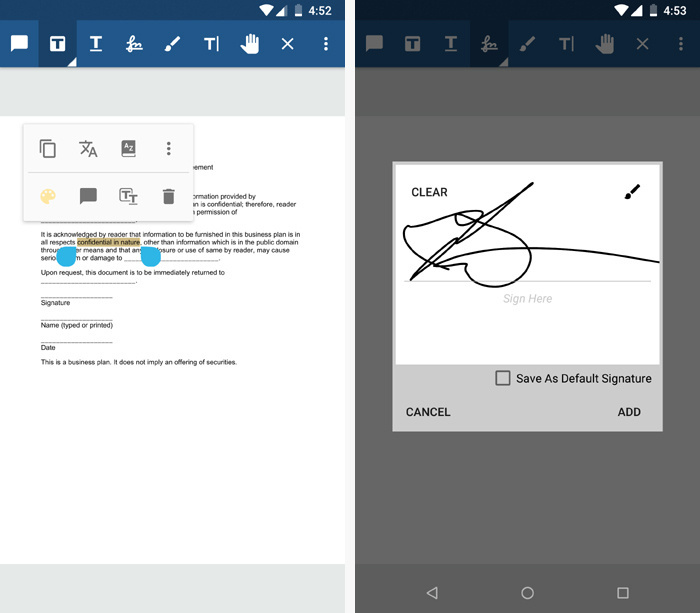 It also has a signature feature that lets you sign any PDF on the spot or store your signature so you can stamp it with a couple of quick taps in the future. From text highlighting to simple signature placement, Xodo gives you a complete toolbox for on-the-go PDF editing. Seems to good to be true for a free app, right? That was certainly my first thought: What's the catch? But Xodo swears it never collects or stores any personally identifiable info or attempts to sell any of your data as part of this program. Instead, the company relies on enterprise licensing and the licensing of its underlying technology to turn a profit. Win-win, right? And with that, your Android office app power-pack is complete. Don't forget: We'll tackle messaging apps, including email, next. For now, time to take a brief break (I recommend a grape soda) and then think about what other categories of standout software could help supercharge your mobile productivity setup. Note-taking apps? Travel apps? Maybe some clever apps for making your phone more efficient? Whatever you need, I've got you covered.